I’m so excited by how it’s turning out, I’m becoming a little obsessive with it and taking it everywhere with me so I can work on it. I’m keeping all the paper pieces inside the hexies, because I find I can bend them and manipulate the fabric without losing the points. Amazing how quick this part seems to be going ~ and now once these are sewn… the top part is done!! Last week I was able to get to the “Sew-cial” at Modern Domestic and got to practice some free-motion quilting. It’s a lot harder than it looks, and I know I’m going to need quite a bit more practice before I quilt my squid! 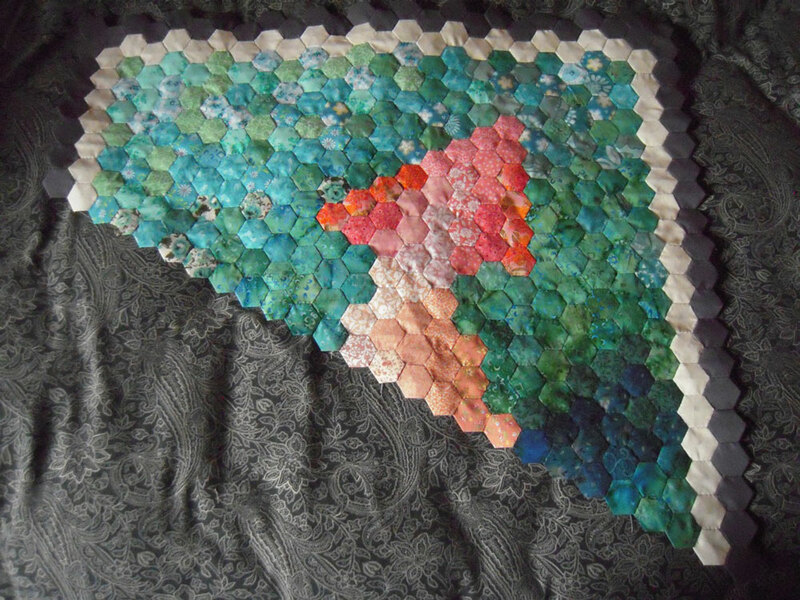 Christina at A Few Scraps has many great tutorials and help with inspiration ~ so I know how I want to do the quilting… now I just need the practice. Speaking of Christina, new officers were chosen to serve the PMQG for 2011 and she will be taking over Jennifer’s role as president. The PMQG is fairly new ~ just started in 2010, so I think it’s already off to a fantastic start, and I’m sure it will continue to grow. Last week I went to the last meeting of the year and it was really fun! It was a potluck and there was a fun gift swap where everyone brought fabric to the last meeting swapped it and made a gift for the original fabric owner from their stash. There are some amazingly creative people in that group ~ check out this blog to see all the things that were made ~ wow!! Of course, I brought my squid quilt to work on, and I got great feedback from a lot of people about it and so that ends up being fuel for my obsessive sewing fire! 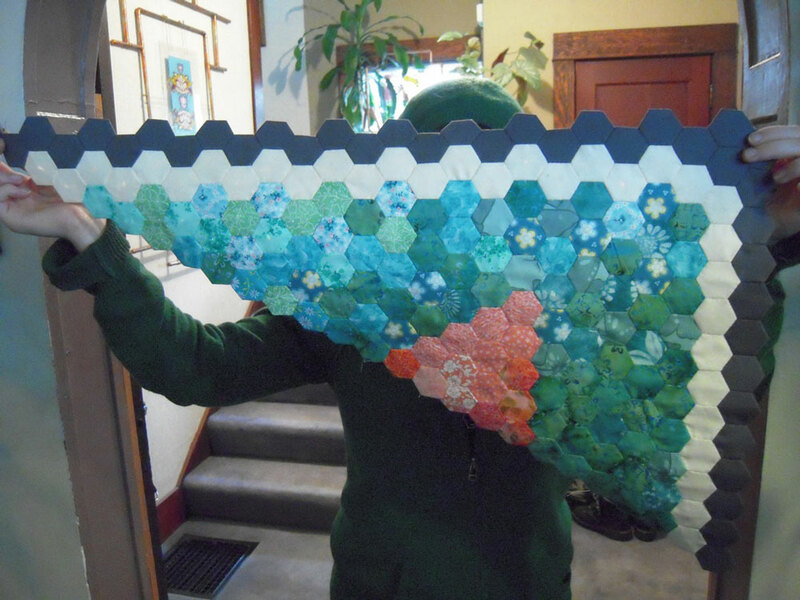 My goal is to have this quilt top done by my birthday in Jan… and hopefully have it quilted by the end of Feb. I guess we’ll just have to see how much my fingers and joints can handle!